" "I appreciated the promptness of your technician as he arrived at the time of the appointment. He is a good asset to the company. Thank you for your services." "
← Don’t Knock Down Houston Wasp Nests! 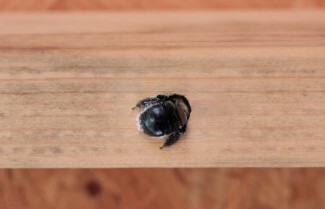 Are Carpenter Bees Working On Your Houston Home? Carpenter Bee Drilling Hole Damaging Wood. 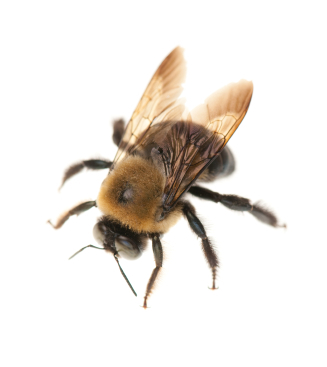 Carpenter bees are often times confused with bumble bees because of their similar body shape and colors. These two types of bees however are quite different with the exception that they both collect pollen and nectar. Bumble bees are docile bees that make their nests in the ground. They don’t typically sting unless one decides that holding them would be a good idea. Male carpenter bees are territorial and will approach any person or animal that crosses their path. Their flight pattern straight into the face of a person is a way that they show intimidation. There’s no need to fear these bees, despite the stare down that they will exhibit, because they don’t have the capability to sting. Female carpenter bees are not often seen but their presence is easily noticed. Piles of sawdust on the ground or deck will let you know that they have made your home their home. Female carpenter bees spend their time drilling perfect holes into wood sources so that they can create a gallery to place their eggs for the next generation of bees. During the spring and early summer, carpenter bee activity is high as the females drill through different types of wood sources. Unpainted wood is the favored nesting site for carpenter bees, but they will take up residence in painted wood if need be. In addition to making the nest and mating, the females collect pollen and nectar from nearby plants for their special nectar and pollen concoction that the baby bees will feed upon. Sometime in the early fall, the new carpenter bees will emerge from the nesting site. The baby carpenter bees will then have their fill of pollen and nectar from nearby flowers before they return to the nest to overwinter. The following spring, the next generation of carpenter bees will emerge and the carpenter bee cycle begins once again. Left alone, a carpenter bee has been known to drill its gallery up to ten feet within a structure. With each year that follows, the galleries become problematic as the carpenter bees continue to drill deeper into wood. It is not uncommon for many females to share the same entrance hole with many gallery off-shoots. As times goes on, the wood structure will weaken. In addition to eradication, it is important to properly seal the holes so that other carpenter bees or unwanted pests do not take over the places where the bees once lived. A Houston pest control expert like Protex Pest Control will be able to identify carpenter bee nesting sites and eliminate the bees. This entry was posted in Pest Control. Bookmark the permalink. Don’t Knock Down Houston Wasp Nests! Tomball Pest Control, Conroe, Kingwood, Magnolia, Montgomery, Humble, Atascocita, Katy, Texas and surrounding areas. ©2012 Protex Pest Control All Rights Reserved.